U.S. #1183 pictures the state flower, the sunflower, and a pioneer family with a covered wagon and stockade. 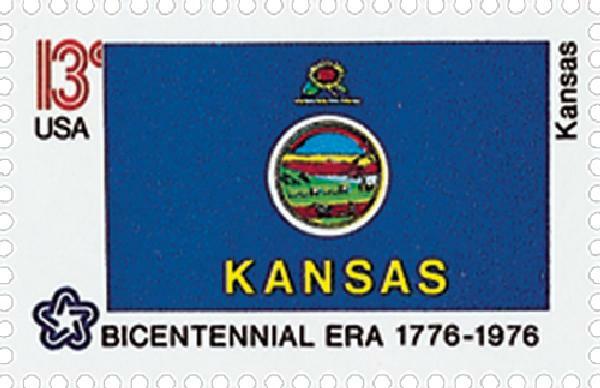 On January 29, 1861, Kansas was admitted to the Union as America was on the brink of Civil War. Four main tribes lived in eastern Kansas before white settlers arrived – the Kansa, Osage, Pawnee, and Wichita. After acquiring horses by the late 1700s, the Arapaho, Cheyenne, Comanche, Kiowa, and other tribes moved into the central plains to hunt buffalo. U.S. #1061 – Click the image to learn about the 1854 Kansas-Nebraska Act. Spanish explorer Francisco Vásquez de Coronado led the first whites into the area in 1541. Coronado’s expedition was looking for a land called Quivira, where an Indian guide told him he would find gold. No gold was found, and the Spanish left without creating a settlement. By the early 1600s, France had claimed much of North America, including Kansas. During the early 1700s, French fur trappers began to settle in what is now the northeastern corner of Kansas. In 1803, France sold the vast Louisiana Territory to the United States, including most of Kansas. The southwestern corner of present-day Kansas was claimed by Spain. This land would later become part of Mexico, and then Texas, before being made part of Kansas. Kansas was governed as part of the District of Louisiana, the Louisiana Territory, and the Missouri Territory. Many Indians from the East were resettled in Kansas for a time. But soon, whites began to settle the area. Some came as missionaries to the Indians and others decided to stay while traveling the Santa Fe Trail. In 1827, Colonel Henry Leavenworth opened the first U.S. outpost, Fort Leavenworth. By 1850, there was substantial pressure to open Kansas for white settlement. The Federal Government negotiated with Indians and reclaimed most of the land. 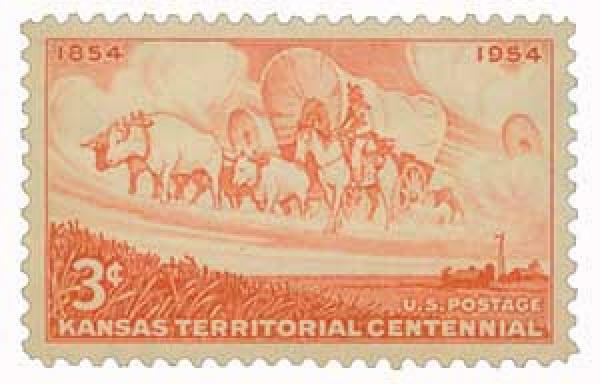 In 1854, Kansas was declared open for settlement. The Indians were sent to reservations in Oklahoma – but some decided to fight. However, none of these groups were successful for long. U.S. #3576 pictures a combine harvester and grain elevator. During the 1850s, Kansas became the center of the America’s fight over slavery, an issue which had divided the nation. In Congress, slavery created a deep rift between the North and South. This was particularly true concerning the fate of new U.S. territories – there was a great struggle over whether the practice of slavery would be allowed in the new territories or not. Congress sought to avoid the issue with the Kansas-Nebraska Act, which essentially let the people who settled these territories decide whether slavery would be legal or not. 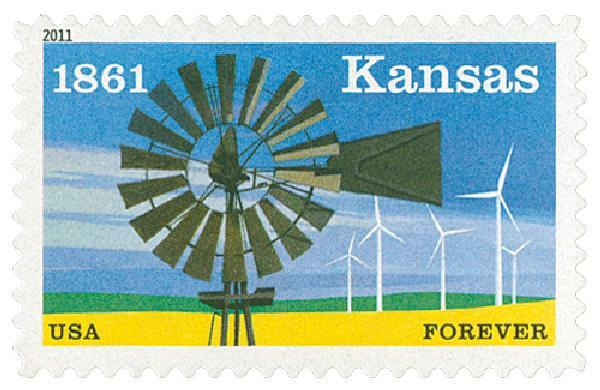 U.S. #4493 pictures the classical and modern ways Kansas harnesses wind power. 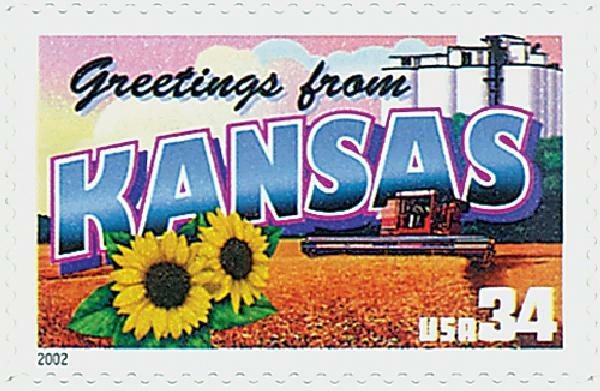 Kansas became a U.S. territory on May 30, 1854. Soon, settlers from the North and South were pouring into Kansas. Groups looking to influence the decision over slavery aided these people in an attempt to gain a majority. In the election of 1855, many citizens from the slave state of Missouri came to Kansas and voted. Proslavery candidates did well in the election. Soon after, violence broke out in Kansas, particularly near the border with Missouri. The fighting became so intense that newspapers began to call the territory “Bleeding Kansas.” Proslavery officials wrote a constitution favoring slavery, but Congress refused to admit Kansas to the Union as a slave state. Finally, politicians opposed to slavery were able to gain control of the legislature. 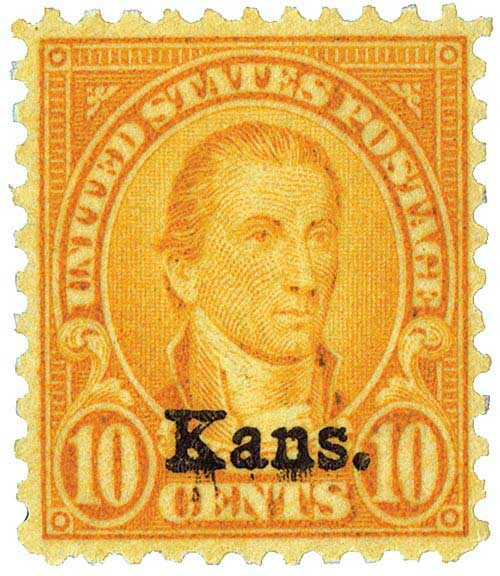 U.S. #668 – Click the image to read the interesting story behind the Kansas-Nebraska stamps of 1929. 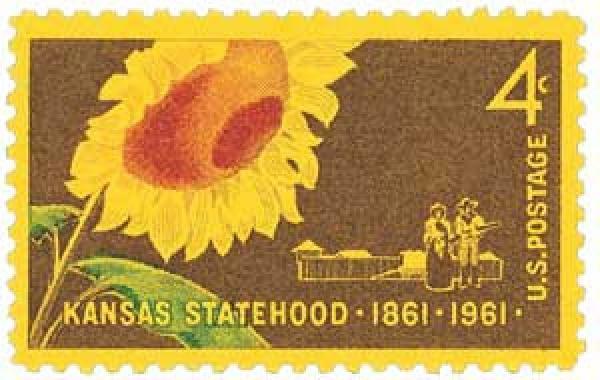 Kansas achieved statehood on January 29, 1861. At that time, several Southern states had already seceded from the Union. Within a few weeks, the Civil War erupted. Kansas was soon hit with a new wave of violence. Confederate raiders under William C. Quantrill burned most of the town of Lawrence, Kansas, and killed about 150 people. During the war, Kansas sent more men to the Union Army in proportion to its total population than any other state. When the war ended in 1865, thousands of Union veterans and newly freed slaves moved to Kansas. In the years following the war, Kansas became a major ranching and farming center (dubbed the Breadbasket of America). Water shortages have plagued the state, though, particularly during the Dust Bowl of the 1930s. 10 Responses to "This Day in History… January 29, 1861"
I was disappointed that you failed to tell us why the overprints (kans and nebr) were necessitated. We attempted to address that story with link and caption for U.S. #668 stamp in the article. It’s a great story. And the stamps are really neat. Since this is history of the event, not the stamp, I suppose that it the reason for the overprint not being mentioned but you can find the explanation in the catalog. It was simply to prevent theft which was rampant in MO. and KA. When the experiment failed so did the overprints. Did you see the caption for the “Kans.” overprinted stamp? I find it humorous that the majority of the comments “regret”that nothing was provided regarding the story behind the overprints! As philatelists we are typical stereotyped as detail people who see the less obvious—yet many readers missed the explanation of the overprints or failed to click on the link. Details….details. I’ve opened “This Day In History” every morning since the first article was offered on July 1, 2015. I looking forward to the March 11 stamp as that day is my 78th birthday. Thank you for doing this for those of us who love collecting stamps and love reading the rich history of our country as reflected in U.S. Postage Stamps. Been all across Kansas and it has a beauty that is in the wide expanses of farm land. Thanks for the history of this fine state of nice people. Kansas is one of the most productive agricultural states producing wheat, corn, sorghum and soybeans.With its about 29 million people the 34th most populous of the 50 United States.